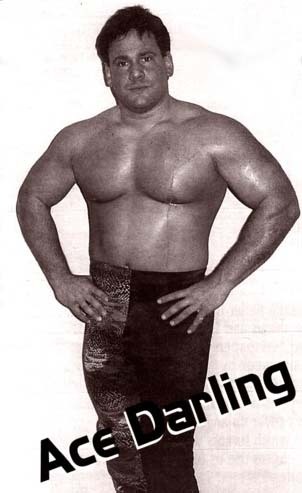 November 15, 1993 – RAW: The Headshrinkers defeated Ace Darling & Mike Bucci..
May 28, 1994 – Superstars of Wrestling: IRS (Mike Rotundo) defeated Ace Darling..
September 1995: Ace Darling & Kid Flash defeated Hollywood Hunks for the ECWA Tag Team titles..
November 17, 1995: Steve Corino & Lance Diamond defeated Ace Darling & Kid Flash for the Tag Team titles..
March 2, 1996 – Delaware: Ace Darling defeated Cheetah Master for the ECWA Title..
February 22, 1997 – Super 8: Ace Darling beats Inferno Kid, Lance Diamond & Cheetah Master to win the Super 8 Tournament! January 27, 1997 – Nitro: The Outsiders defeated Ace Darling & Devon Storm..
February 1, 1997 – Saturday Night: Glacier defeated Ace Darling..
February 10, 1997 – Nitro: The Outsiders defeated Ace Darling & Devon Storm (again)..
March 22, 1997 – Saturday Night: Public Enemy defeated Ace Darling & Devon Storm..
April 14, 1997 – Nitro: Joe Gomez & Ice Train defeated Ace Darling & Devon Storm in a dark match..
March 21, 1998 – Super 8 Tournament: Ace Darling beat Mike Quackenbush and then loses to The Inferno Kid..
November 28, 1998: Ace Darling & Devon Storm defeated Lance Diamond & Cheetah Master for Tag Team titles..
February 27, 1999 – Super 8 Tournament: Steve Bradley defeated Ace Darling in the opening round..
April 17, 1999: Mark Schrader & Christian York defeated Ace Darling & Devon Storm for the Tag Team titles..
February 26, 2000 – Super 8 Tournament: Chris Daniels defeated Ace Darling (sub for Jet Jaquar) in Round 2 round..
February 3, 1996 – Eddie Gilbert Memorial Show: Ace Darling defeated Kid Flash in Cherry Hill, NJ..
April 12, 1997 – Eddie Gilbert Memorial Show: Flash Funk defeated Ace Darling in Cherry Hill, NJ..
April 26, 1997: Ace Darling defeatd Simon Diamond for the NWA North American title..
June 14, 1997: Reckless Young defeated Ace Darling for the NWA North American title..
February 28, 1998 – Eddie Gilbert Memorial Show: Ace Darling & Devon Storm beat The Misfits for the NWA US Tag Team titles..
March 22, 1998: The Misfits defeated Ace Darling & Devon Storm to recapture the NWA US Tag Titles..
July 31, 1998: Ace Darling defeated Ray Odyssey for the NWA Light Heavyweight (97-98) Title..
May 11, 2002: Ace Darling defeated Simon Diamond for the JCW Television Championship..
May 18, 2002: Simon Diamond defeated Ace Darling to recapture the JCW Television title! February 22, 2003: Ace Darling & Striker defeated Los Maximos, Da Hit Squad, Nana & Mega to win the Tag Team titles! 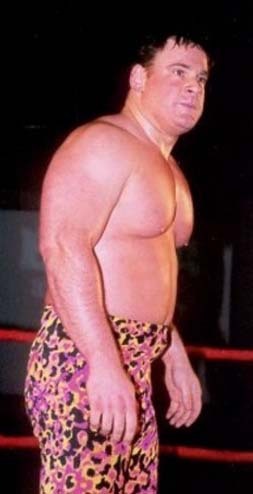 April 5, 2003: Los Maximos & Striker defeated Ace Darling & Mega & Prince Nana by DQ..
May 3, 2003: Ace Darling & Striker defeated The Maxx Brothers (Johnny & Joey) to retain..
July 26, 2003: Ace Darling & Striker defeated Cheetah Master & Johnny Maxx to retain..
September 6, 2003: The Maxx Brothers defeated Ace Darling & Striker for the Tag Team titles..
November 8, 2003: Ace Darling participates in a War Games Cage match — Team 1 defeated Team 2..
May 1, 2004–ECWA: Prince Nana defeated Ace Darling to win Mid Atlantic title..
July 16, 2005–ECWA: Cheetah Master & Ace Darling defeated Freak Nasty & Mike Kruel..
September 24, 2005–ECWA: Mike Kruel defeated Ace Darling..
December 3, 2005–ECWA: Fred Sampson defeated Ace Darling to retian the ECWA title ..
~~~After the match, Devon Storm ran down and reunited with his former tag partner Ace Darling..
March 4, 2006–ECWA: The Valedictorians defeated Devon Storm & Ace Carling..
May 20, 2006–National Wrestling Superstars: Shane Taylor beat Antonio Malave and Ace Darling in a 3-WAY..
July 22, 2006–ECWA: Ace Darling & Chase Del Monte defeated Kermon the German & Mike Reed …. 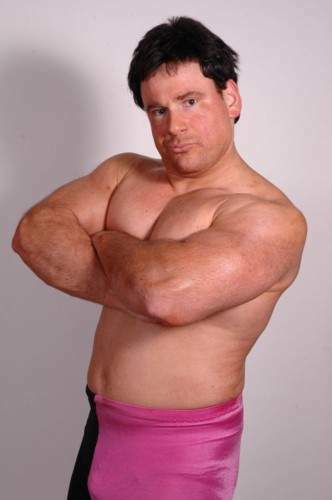 September 30, 2006–National Wrestling Superstars: Larry Zybysko defeated Ace Darling..
October 6, 2006–National Wrestling Superstars: Jimmy “Superfly” Snuka defeated Ace Darling..
December 1, 2006–NWS: The Sychdelis Sissies vs Team Supreme (Nicky Oceans & Corvis Fear) ended in a No Contest..
January 19, 2007–National Wrestling Superstars: Sychodelic Sissies (Ace Darling & Shane Taylor) defeated Javi-air & Gil Quest..
February 9, 2007–NWS (J-Cup Tag Team Tournament): The Sychadelic Sissies defeated J.T. Highlander & Dublin Destroyer #1..
~~~The Sychadelic Sissies defeated The New Ebony Experience in the 2nd Round of the J-Cup Tag Team Tournament..
~~~Nicky Oceans & Corvis Fear defeated Trent Acid & Rob Eckos and The Sychadelic Sissies in the 3-WAY Finals..
February 17, 2007–National Wrestling Superstars: Ace Darling & Rob Eckos defeated Team Supreme (Nicky Oceans & Corvis Fear)..
April 7, 2007–National Wrestling Superstars: Big Slam Vader & Dave Duncan defeated Shane Taylor & Ace Darling w/Rocco Dorsey..
April 20, 2007–National Wrestling Superstars: Team Supreme (Nicky Oceans & Corvis Fear) defeated The Sychodelic Sissies..
May 12, 2007–East Coast Wrestling Association: Ace Darling defeated Chase del Monte in Newark, Delaware ..
August 18, 2007–National Wrestling Superstars: The Sychedelic Studs defeated Great Garafalo & Mikey Pacifica..
November 2, 2007–National Wrestling Superstars: Rob Eckos & Mikey Quest defeated The Sychedelic Sissies in a Non-title match..
November 30, 2007–National Wrestling Superstars: The Sychadelic Sissies/Studs defeated Franciz & Dark Angel in a tag team match..
December 7, 2007–NWS: Ace Darling & Nicky Oceans defeated The Boy Toys (Myke Quest & Rhett Titus)..
January 25, 2008–National Wrestling Superstars: The Sychadelic Sissies participated in the Jersey J-Cup Tag-Team Tournament..
~~~FIRST ROUND: The Sychadelic Sissies/Studs (Nicky Oceans & Ace Darling) defeated Ryan Rumble & JT Highlander..
~~~FINALS: The Gemini Trojans defeated The Sychadelic Sissies/Studs to win the Jersey J-Cup Tag Team Tournament! January 26, 2008–NWS: The Sychadelic Sissies participated in the Jersey Shore Triple-Threat Tag-Team Tournament..
~~~The Psychedelic Studs beat Mikey Pacifica & Blade Michaels and Mythril & Corrupted Youth in a 3-WAY Tag match..
~~~The Psychedelic Studs defeated The Gemini Trojans and Self-Employed in a 3-WAY Elimination Tournament Finale..
April 19, 2008–National Wrestling Superstars: Honky Tonk Man defeated Ace Darling w/Gigolo Joe. May 3, 2008–National Wrestling Superstars: Honky Tonk Man defeated Ace Darling.